To be the player with the smallest score, trying not to take pawns and crowns. Play a card from your hand on one of the branches of the Tree of Life, following the Decktet suits. If once placed, all the cards from that branch add up to more than 12 points, then you'll have to take a number of those cards, from end towards the beginning, until they add up to at least 13 points. You've got to try to take the least number of cards, but if you've got to take many, at least try to have the most cards possible from that suit, that way you can be immune to its power. There are 8 poisoned cards (4 pawns and 4 crowns) that spoil the branches and lower your score. Try not to take them. Place the 6 aces on the table in a straight line to the side of the table. They'll be used to mark which player has the most number of cards of a given suit. Place the Excuse, face down, in the middle of the table. From this card, the two main branches of the Tree of Life will grow. Choose a player to deal the cards and start the first hand. In following hands the deal will go to the next player on their left. When starting each hand, the dealer shuffles the deck and deals 4 cards, one by one, to every player. If there are only two players, deal only 3 cards to each one. The player to the left of the dealer starts the game and then turns pass clockwise to each player. 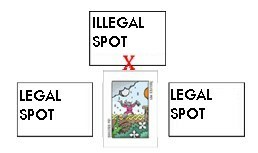 A legal spot is: A free spot near the long side of any card on the Tree so that once placed only connects to one card. The card placed must also share at least once suit with the one it's connecting to. Example 1: The Excuse is the heart of the Tree of Life and it's special. The picture shows how it's legal to place cards on its left or right (its long sides) but not on top of it (one of its short sides). Example 2: The Journey, even though it's placed near the long side of a card and on a free spot, was not legally placed because it doesn't share a suit with the card it connects to. The Desert is not valid either because it connects to more than one card. The other cards are ok because they fulfill the three conditions stated above. If a player is unable to place a card on their turn (no legal spots available) then they must show their hand to the other players. Then the player must discard a card on top of the Excuse and take a card from the deck. The cards remaining over the Excuse will be added to the next trick. In this game the numeric value of the crowns and pawns is 1. 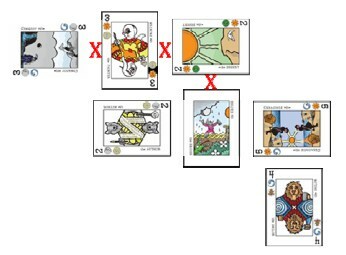 If a player plays a card that causes the addition of the ranks of all the cards on its branch to exceed 12 points, then a trick is triggered and the player must take cards, starting from the last one on that branch towards the Excuse until the cards taken add up to at least 13 points. Afterwards, any card that became isolated, must also be taken. All the cards taken are placed on a pile in front of the player for scoring purposes at the end of the hand. Example 3: When The Betrayal is placed, this causes that branch to add up to 13 (2 + 3 + 8). 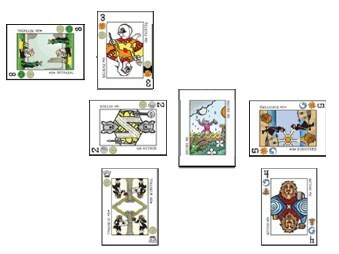 The player must take cards starting with the 8, towards the Excuse. In this case they take the 8, the 3 and the 2, as they add up to 13 points. After that, the player must take the Crown because it became isolated. The Way the Excuse is placed determines who takes the cards on top after a trick is triggered. If the Excuse is front side up, the player that took the trick must deal the cards on top of the excuse to all other players. If the Excuse is face down, then the player triggering the trick must take all the cards. Those players who got cards during a trick must check, for every different suit on the cards taken, how many cards they have of that suit. They announce those numbers and every player checks who's got the most cards of each of those suits. The player who has the most of a given suit takes the Ace of that suit. After the trick ends, the Excuse is turned around, so if it was face up, it becomes face down and viceversa. A hand ends when all the cards have been played. At that point players examine all the cards they took. Each suit on a card scores 1 point, but if a player has an Ace, the matching suits will score 0 points. After that, each crown scores 1 point and each pawn 2 points. These last points are unaffected by the aces the player might have. Example 4: In this case, the Knots don't score because the player has the corresponding Ace. The total score is 15 points (0 from the Ace, 2 from the 2, 2 from the 3, 1 from the 8, 1 from the 2, 5 from the first pawn and 4 from the second pawn). Each player takes a note of their score for the hand and a new hand is started. After playing one hand per player in the game, the total score is calculated and the payer with the lowest score wins the game. Each time a trick is triggered, the Excuse changes its status. This makes every card in your hand important. Sometimes higher cards will be more important than lower ones but not always because some times you want to take the trick to get one of the majorities or so your opponents have to take cards. It's vital to adapt your play to the Excuse's status. Plan ahead for the last four turns. Note that when the deck runs out you won't be able to take cards so you'll be forced to play the last 4 cards you have in your hand. Those cards can sometimes cause you to gain too many points. It can be good to save lower cards for those last turns so you're not forced to take any tricks, but the Excuse may force you to change your plans. Try not to take pawns and crowns. They always give you points. Try to use the Excuse to give those cards to your opponents. The original Spanish text for these rules is (c)2009 José Carlos de Diego Guerrero and was released under a Creative Commons license. The translation is (c)Jorge Arroyo, was made with permission from the original author, and released under the same license. Blog post from the designer where the game was introduced.